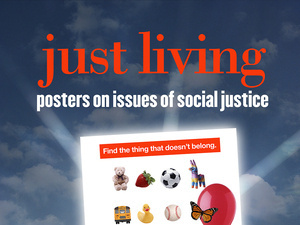 Students in the graphic design class in the School of Journalism and Mass Communication last fall each designed a poster relating to social justice. The Tuesday-evening class discussed issues related to social justice, and each student then chose a topic that was personally important to them. Wide-ranging in topics, the student work shows both the importance of design in getting a message across, as well as how we all are connected to these issues in a personal way. The project was inspired by the UI spring semester theme Just Living.